Yes I ! Number ONE and the Reggae Machine are working on the new album " Somebody " Peace and Power ! Composer, singer & arrangeur Number O.N.E. (Original Natural Energy) from the Ivory Coast creates a new kind of reggae music without departing from the roots. Raised in Yamoussoukro (the capital city of the Ivory Coast) he had flirted around with rap music until the time he fell in love with reggae music in 1996. 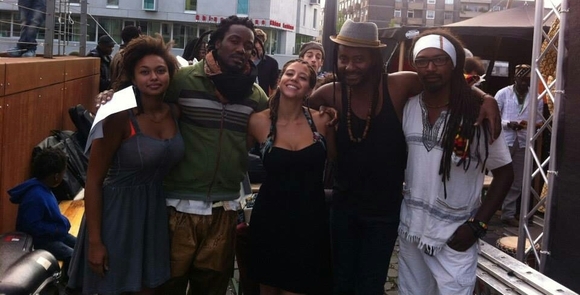 Guided by JAH, Number ONE founded a music group called “Rastamen” made up of his fellow students who belonged to the orchestra of the university of Abidjan. In 2003 he released his debut album “JAH IS MY DRIVER” and two years later at a ceremony called “Top d’or” (golden top) the “Palais de la Culture” dubbed Number ONE and his group as the “reggae revelation of the year”. Today Number ONE lives in Cologne (Germany) where he is preparing his upcoming album together with the Reggae Machine band.